Blunt's father, a vicar, was assigned to Paris with the British embassy chapel, and moved his family to the French capital for several years during Anthony's childhood. The young Anthony became fluent in French and experienced intensely the artistic culture closely available to him, stimulating an interest which lasted a lifetime and formed the basis for his later career. He was educated at Marlborough College, where he joined the college's secret 'Society of Amici', in which he was a contemporary of Louis MacNeice (whose unfinished autobiography The Strings are False contains numerous references to Blunt), John Betjeman and Graham Shepard. He was remembered by historian John Edward Bowle, a year ahead of Blunt at Marlborough, as "an intellectual prig, too preoccupied with the realm of ideas". Bowle thought Blunt had "too much ink in his veins and belonged to a world of rather prissy, cold-blooded, academic puritanism". Like Guy Burgess, Blunt was known to be homosexual, which was a criminal offence at the time in Britain. Both were members of the Cambridge Apostles (also known as the Conversazione Society), a clandestine Cambridge discussion group of 12 undergraduates, mostly from Trinity and King's Colleges who considered themselves to be the brightest minds in the university. Many were homosexual and Marxist at that time. Amongst other members also later accused of being part of the Cambridge spy ring were the American Michael Whitney Straight and Victor Rothschild, who later worked for MI5. Rothschild gave Blunt £100 to purchase Eliezar and Rebecca by Nicolas Poussin. The painting was sold by Blunt's executors in 1985 for £100,000 (totalling £192,500 with tax remission) and is now in the Fitzwilliam Museum. There are numerous versions of how Blunt was recruited to the NKVD. As a Cambridge don, Blunt visited the Soviet Union in 1933, and was possibly recruited in 1934. In a press conference, Blunt claimed that Guy Burgess recruited him as a spy. Many sources suggest that Blunt remained at Cambridge and served as a talent-spotter. He may have identified Burgess, Kim Philby, Donald Maclean, John Cairncross and Michael Straight – all undergraduates at Trinity College (except Maclean at the neighbouring Trinity Hall), a few years younger than he – as potential spies for the Soviets. Blunt passed the results of Ultra intelligence from decrypted Enigma intercepts of Wehrmacht radio traffic from the Russian front. He also admitted to passing details of German spy rings operating in the Soviet Union. Ultra was primarily working on the Kriegsmarine naval codes, which eventually helped win the Battle of the Atlantic, but as the war progressed Wehrmacht army codes were also broken. Sensitive receivers could pick up transmissions, relating to German war plans, from Berlin. There was great risk that, if the Germans discovered their codes had been compromised, they would change the settings of the Enigma wheels, blinding the codebreakers. In 1963, MI5 learned of Blunt's espionage from an American, Michael Straight, whom he had recruited. Blunt confessed to MI5 on 23 April 1964, and Queen Elizabeth II was informed shortly thereafter. He also named John Cairncross, Peter Ashby, Brian Symon and Leonard Henry (Leo) Long as spies. Long had also been a member of the Communist Party and an undergraduate at Trinity College, Cambridge. During the war he served in MI14 military intelligence in the War Office, with responsibility for assessing German offensive plans. He passed analyses but not original material relating to the Eastern Front to Blunt. Queen Elizabeth II stripped Blunt of his knighthood, and in short order he was removed as an Honorary Fellow of Trinity College. Blunt resigned as a Fellow of the British Academy after a failed effort to expel him; three fellows resigned in protest against the failure to remove him. He broke down in tears in his BBC Television confession at the age of 72. ^ Carter 2001, p. 180. ^ Carter 2001, p. 302. ^ Carter 2001, p. 319. ^ GRO Register of Deaths: MAR 1983 15 2186 WESTMINSTER – Anthony Frederick Blunt, DoB = 26 September 1907; Varriano 1996. ^ Shone, Richard and Stonard, John-Paul, eds. The Books that Shaped Art History, Introduction. London: Thames & Hudson, 2013. ^ Hopkins, Andrew (2000). "Review of Art and Architecture in France 1500-1700 by Anthony Blunt, Richard Beresford", The Sixteenth Century Journal, vol. 31, no. 2 (Summer), pp. 633-635. JSTOR 2671729. ^ a b c d e Levy, Geoffrey (27 June 2009). "Last secrets of the Queen Mother's favourite traitor: Memoirs of society spy Anthony Blunt could rock Royals". Daily Mail Online. Retrieved 30 July 2015. ^ a b c d e f g h Carter, Miranda (2001). Anthony Blunt: His Lives. London: Macmillan. ISBN 9780330367660. ^ Hinde, Thomas (1992). Paths of Progress: A History of Marlborough College. London: James & James. ISBN 9780907383338. ^ a b c Wright, Peter (1987). Spycatcher: The Candid Autobiography of a Senior Intelligence Officer. Toronto: Stoddart Publishers. ISBN 9780773721685. ^ a b Pierce, Andrew; Adams, Stephen (22 July 2009). "Anthony Blunt: confessions of spy who passed secrets to Russia during the war - Telegraph". The Daily Telegraph. London: TMG. ISSN 0307-1235. OCLC 49632006. Retrieved 30 July 2015. ^ "Eliezer and Rebecca by Nicolas Poussin". Art Fund. Retrieved 30 July 2015. ^ Press Conference of Anthony Blunt. YouTube. Archived from the original on 18 May 2015. Retrieved 30 July 2015. ^ Carter 2001, pp. 106–107. ^ Hennessy, Peter (2002). The Secret State: Whitehall and the Cold War. London: Allen Lane. ISBN 0-7139-9626-9. ^ Hinsley, F. H.; Stripp, Alan, eds. (2001). Codebreakers: The Inside Story of Bletchley Park. Oxford: Oxford University Press. ISBN 9780192801326. ^ Boyle, Anthony (1982). The Climate of Treason. London: Hutchinson. ISBN 9780091430603. ^ Higham, Charles (1988). The Duchess of Windsor: The Secret Life. New York: McGraw-Hill Publishers. pp. 388–389. ISBN 9780070288010. ^ Rees, Goronwy (1972). A Chapter of Accidents. London: Chatto & Windus. ^ Mrs Margaret Thatcher, The Prime Minister (9 November 1981). "Mr. Leo Long (Written Answers)". Parliamentary Debates (Hansard). House of Commons. col. 40W–42W. ^ Burns, John F. "Memoirs of British Spy Offer No Apology" The New York Times, 23 July 2009. ^ Mrs Margaret Thatcher, The Prime Minister (15 November 1979). "Security (Written Answers)". Parliamentary Debates (Hansard). House of Commons. col. 679W–681W. ^ Mrs Margaret Thatcher, The Prime Minister (21 November 1979). "Mr. Anthony Blunt". Parliamentary Debates (Hansard). House of Commons. col. 402–520. ^ a b c "1979: Blunt revealed as 'fourth man'". BBC. Retrieved 30 July 2015. ^ Penny, Nicholas (29 November 2001). "Joining the Gang". The London Review of Books. 23: 23–29. Retrieved 30 July 2015. ^ Lydall, Ross (22 October 2012). "Brian Sewell: Soviet double agent Anthony Blunt did no harm to Britain". London Evening Standard. Retrieved 30 July 2015. ^ "The Cambridge Four". nationalcoldwarexhibition.org, (RAF Museum). Retrieved November 17, 2017. ^ Lubenow, William C. (2015). 'Only Connect': Learned Societies in Nineteenth-century Britain. Woodbridge: The Boydell Press. p. 265. ^ "Spy's secret memoir 'held in library'". BBC News. 20 October 2001. Retrieved 25 April 2010. ^ "Access to the Manuscript Memoir of Anthony Blunt". The British Library. Retrieved 30 July 2015. ^ a b c "Blunt's Soviet spying 'a mistake'". BBC News. Retrieved 30 July 2015. ^ Thompson, Barbara; Morck, Virginia (Autumn 2004). "The Courtauld Institute of Art 1932–45". The Courtald Institute of Art Newsletter. ^ Penrose, Barrie; Freeman, Simon (1986). Conspiracy of Silence: The Secret Life of Anthony Blunt. London: Grafton. ISBN 9780246122001. ^ Cooke, Rachel (13 November 2005). "We pee on things and call it art". The Guardian. Retrieved 30 July 2015. ^ Mullan, John (11 February 2006). "Artifice and intelligence". The Guardian. Retrieved 30 July 2015. ^ Gunn, Rufus (1997). A Friendship of Convenience. Swaffham, Norfolk: Gay Men's Press. ISBN 9780854492442. Banville, John (1997). The Untouchable (novel). London: Picador. ISBN 9780330339315. Bennett, Alan (1988). A Question of Attribution, first theatre performance as the second part of a double-bill, with An Englishman Abroad about Guy Burgess as the first part, London, 1988; broadcast as television play, 1991; both plays published in one volume as Single Spies, London, Faber, 1989, ISBN 0-571-14105-6. Bounds, Philip (2018). 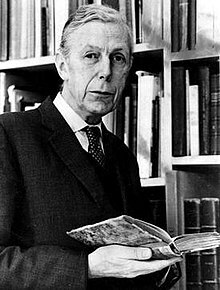 "A Spy in the House of Art: The Marxist Criticism of Anthony Blunt", Critique: Journal of Socialist Theory, vol. 46 no. 2, pp. 343-362. Boyle, Andrew (1979). The Climate of Treason: Five Who Spied for Russia. London: Hutchinson. ISBN 9780091393403. Burlington (1974). "Editorial: Anthony Blunt and the Courtauld Institute". The Burlington Magazine, vol. 116, no. 858 (September 1974), p. 501. Carter, Miranda (2001). Anthony Blunt: His Lives, Pan. ISBN 0-330-36766-8. Chastel, André (1983). "Anthony Blunt, art historian (1907–1983)", The Burlington Magazine, vol 125, no. 966 (September 1983), pp. 546–547. Costello, John (1988). Mask Of Treachery, London, Collins. ISBN 0-688-04483-2. De Seta, Cesare (1991). "Anthony Blunt", in Viale Belle Arti. Maestri e amici, Milano, p. 111–138. Foster, Henrietta (2008). "Unearthing an interview with a spy. Newsnight. (23 January 2008). BBC. Retrieved 23 January 2008. Gatti, Andrea (2002). "La critica della ragione. sulla teoria dell'arte di Anthony Blunt", Miscellanea Marciana, vol. 17, p. 193–205. ISSN 0394-7866. Lenzo, Fulvio (2006). Napoli e l'architettura italiana ed europea negli studi di Anthony Blunt, in Anthony Blunt, Architettura barocca e rococò a Napoli, ed. it. a cura di Fulvio Lenzo, Milano, p. 7–15. MacNeice, Louis (1965). The Strings are False, London, Faber. ISBN 0-571-11832-1. Penrose, Barrie and Simon Freeman (1987). Conspiracy of Silence: The Secret Life of Anthony Blunt. New York. ISBN 9780679720447. Petropoulos, Jonathan (2006). The Royals and the Reich. Oxford University Press. ISBN 0195161335. Sorenson, Lee. "Blunt, Anthony". Dictionary of Art Historians. Straight, Michael (1983). After Long Silence: the Man Who Exposed Anthony Blunt Tells for the First Time the Story of the Cambridge Spy Network from the Inside, London, Collins. ISBN 0-00-217001-9. West, Nigel (1999). The Crown Jewels: The British Secrets Exposed by the KGB Archives, London. ISBN 9780300078060. Wright, Peter (1987). Spycatcher: The Candid Autobiography of a Senior Intelligence Officer. Toronto: Stoddart Publishers. ISBN 9780773721685.